According to Alessio Fasano, the Medical Director for The University of Maryland's Center for Celiac Research, no one can properly digest gluten. I am not an expert in the matter, but my understanding is that the very etiology of celiac involves the breakdown of gluten (specifically the gliadin) by tissue transglutaminase, which is definitely an enzyme*. However, in some instances, TG2 can react with water in preference over an amine, leading to the deamidation of glutamine residues. 118,119 Gluten proteins, the immunological trigger of gluten sensitivity, are glutamine-rich donor substrates amenable to deamidation. TG2 contributes to disease development in at least two ways: ﬁ rst, by deamidating gluten peptides and thereby increasing their aﬃ nity for HLA-DQ2/DQ8, which potentiates the T-cell response, 120,121 and, second, by haptenisation of self-antigens through crosslinking with gliadins. 122 This latter activity has been implicated in autoantibody development (ﬁ gure 4). Activation of TG2 and deamidation of gluten peptides seems to be central to disease development and is now well understood at a molecular level. In fact, it's my understanding that testing for celiac often involves looking for those Anti-transglutaminase antibodies. So it's an enzyme that normally breaks down gluten and the process has gone haywire. If we have an enzyme able to do this, wouldn't that allow normal people to break down gluten? Am I misunderstanding things? Because human gastric and pancreatic enzymes lack postproline cleaving activity, the abundance of proline residues in gluten renders it highly resistant to complete proteolytic degradation in the human gastrointestinal tract, a feature that is most likely linked to the disease-inducing properties of gluten. Yes, healthy people are capable of digesting wheat gluten. 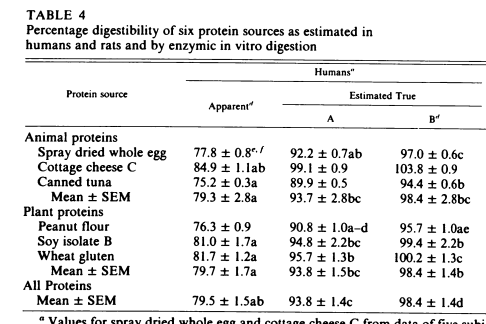 In this study they were attempting to compare the digestibility of several proteins in humans and rats. We are only interested here in gluten and humans. Here's an extract from Table 4. It shows that, depending on which measurement system they used, wheat gluten protein was 80-100% digestible by (healthy) humans. A paper from back in 1949 calculated gluten digestibility using a fairly new (at the time) technique: Nitrogen Balance Indices, to see whether consuming Lysine would help. The mean nitrogen balance index for gluten was 0.62. For gluten plus lysine, it was significantly higher, 0.76, approach ing the value for casein. Thus lysine, was shown to enhance the nutritive value of gluten for humans, as it had previously been shown to do for lower animals. I think there might be a misunderstanding of what tissue transglutaminase (TTG) does. TTG is sold in the food industry as "meat glue"... it's an enzyme for sticking proteins together - specifically an amine and a glutamine. I don't think this enzyme has anything to do with the digestive process. As I understand it, TTG is required to create physically stable cell structures, which is what you need if you're building new tissues in the body. TTG is found all over the body, not just in the gut. They've shown that the interaction of TTG with gluten is part of the pathological process in celiac disease. TTG can stick the glutamine part of the gliadin molecule to other molecules, and when it releases it, the amine gets left behind, creating the "deamidated gluten peptide" (DGP). These DGP can trigger the immune response*. It seems to me that damaged tissue is going to create a lot more TTG as it tries to repair itself, and if the gluten reacting with the TTG is adding to the damage, then the situation can run away with itself. What I don't understand is where the process starts. I reckon that poor digestion is a part of the story, so that more gluten arrives intact in the small intestine, but I also think there is likely to be a factor that allows the TTG and the gluten to get together... maybe the gut barrier breaks down in some way due to dysbiosis. Whatever is happening, I reckon that in someone with a healthy digestion the TTG and the gluten/gliadin would never be able to meet up. This doesn't answer your original question, Melissa, but I write it to dispute your argument that TTG is for digesting gluten. It's not. Not the answer you're looking for? Browse other questions tagged nutrition biology . Are raw button mushrooms unhealthy (especially carcinogenic)?